Levi’im Loving Tishes and Maccabiah! Here we are, writing the last blog post of the summer. Through our tears, we reflect on the past 4 days since our last post. To be honest, it’s kind of hard to tell if we’re crying or if it’s misty in here. 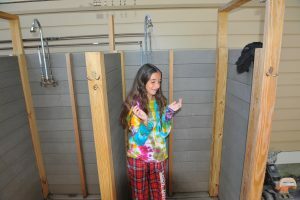 Either way, we’re feeling emotional, and with the great past few days of Maccabiah, the chanichim (campers) have been feeling emotional as well. We celebrated our last Shabbat with ruach (spirit) and kavana (intention). We sang with gusto at ReLiSh (Ruach Lifnei Shabbat, or Spirit Before Shabbat), joined the camp in a meaningful kabbalat shabbat, and enjoyed a dinner of chicken and rice. After birkat hamazon (grace after meals) and all-camp singing, aydat (unit) Leviim, along with Ma’alot and Kerem, stayed back to partake in the annual Levi’im, Ma’alot, and Kerem tisch. After Ma’alot and Kerem left, we, aydat Leviim, stayed in the Ben Tzvi to experience our second tisch of the summer. The chanichim sang with spirit as they belted our their favorite songs, Beshem Hashem (in the name of God), Meheira (may it soon be heard), and Ehsa Einai (I will lift up my eyes). The tisch ended with a inspiring rendition of Hamalach Hagoel (the redeeming angel), and the chanichim left uplifted, feeling more connected to each other and more connected to God.On Shabbat, the Ma’alot banot (girls) passed down the tradition of leading Ein Keloheinu (there is no other like our God) to the Leviim banot. The banot enthusiastically took on this tradition and expressed their excitement about leading the camp next kayitz (summer). Shabbat ended in enthusiastic dancing and singing, leaving the chanichim smiling and sweaty. Since then, the chanich im have been enjoying Maccabiah, participating actively in competitions ranging from kickball to defrosting frozen t-shirts to catching fish. We are looking forward to a final 3 days with these unbelievable kids and we are already counting down the days till we can reunite with them for Ma’alot 2016.